For a bartender, dream jobs don’t get more prestigious than Head Bartender of the American Bar at The Savoy in London, an esteemed position held by a select group of legendary bartenders such as Ada Coleman, Harry Craddock and Joe Gilmore. In the 1920s and 30s, the American Bar was the center of the cocktail zeitgest, an Art Deco watering hole for London’s high society and a sanctuary for elite Americans seeking the mixed drinks that were forbidden by Prohibition back home. Craddock, a bartender from New York who arrived in London in 1920, became Head Bartender of the American Bar in 1925. In 1930, the hotel published The Savoy Cocktail Book, featuring 750 recipes compiled by Craddock and “decorations” by Gilbert Rumbold. The iconic book has remained in print ever since and has been republished several times, most recently in 1999 with several new recipes by Peter Dorelli, who was Head Bartender until his retirement in 2003. The current Head Bartender of the American Bar is Erik Lorincz, a 31-year-old native of Slovakia who began his tenure when The Savoy reopened on October 10, 2010 after a three-year, $300 million renovation. Lorincz will be adding to The Savoy legacy with some cocktail recipes of his own, when a new edition of The Savoy Cocktail Book is released this summer. 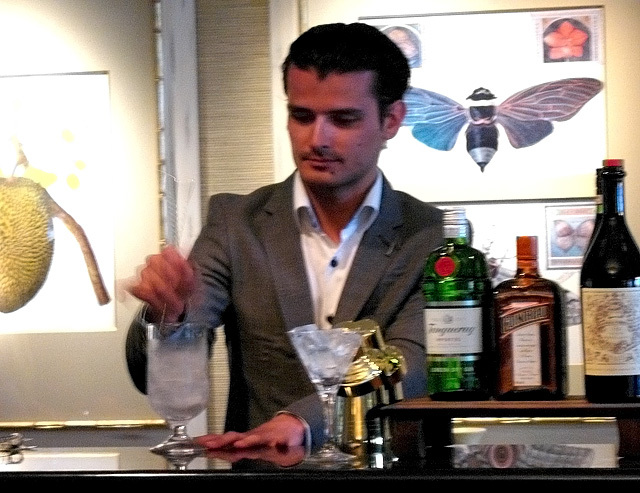 Prior to his Savoy gig, Lorincz was the Senior Mixologist at The Connaught Bar, named World’s Best Hotel Bar at the 2010 Tales of the Cocktail Spirited Awards. It was during his stint at The Connaught that Lorincz won the title of the Diageo Reserve World Class Bartender of the Year 2010, the culmination of a year-long global challenge that began with 9000 bartenders from around the world competing in regional heats. The final took place in Athens, where Lorincz went up against 23 other bartenders in head-to-head competition over four days of challenges. This year, 10,000 bartenders will be competing to get to the Diageo final in Delhi, India. Lorincz will be there to advise and support the finalists. Lorincz was in Los Angeles recently for an event that celebrated the Condé Nast Traveler 2011 Hot List, the magazine’s 15th annual guide to the world’s best new hotels, spas, and restaurants. For the first time, the special issue names individuals who made an impact on the hospitality industry in the past year. Lorincz was chosen as Hot Bartender, while other honorees include José Andrés (Hot Restaurateur) and Nick Jones of Soho House Group (Hot Hotelier). 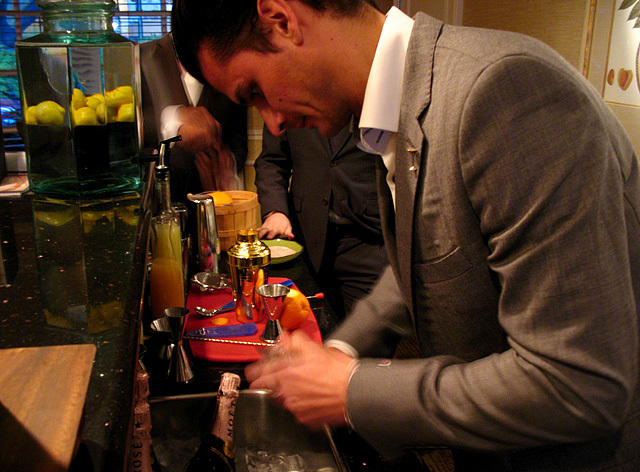 As part of a media tour, Lorincz taught a Cocktail Master Class at the Fairmont Santa Monica, The Savoy’s sister property. During this hands-on session, a small group would learn how to make two Savoy classics and one of Lorincz’s own creations. The class began with Lorincz introducing himself and giving some insight into the path that has led him to the top of his profession. The seeds for Lorincz’s globe-trotting career were planted at an early age by his grandmother, an herbalist who taught him how to make tinctures, oils and herbal teas. His father, a winemaker who likes to make his own eaux de vie, was similarly influential in showing his techniques to the young Erik. While still a teenager, Lorincz moved to Prague to immerse himself in a bartender educational program and learn the craft of the cocktail. Armed with his new knowledge and skills, Lorincz returned to Slovakia and eventually became a bar manager in Bratislava, the capital of Slovakia. When he wanted to learn English, Lorincz relocated to London and ended up at Attica, a now-defunct nightclub in Soho. Since he couldn’t speak English, Lorincz had to start at the bottom, sweeping the floor and emptying ashtrays. 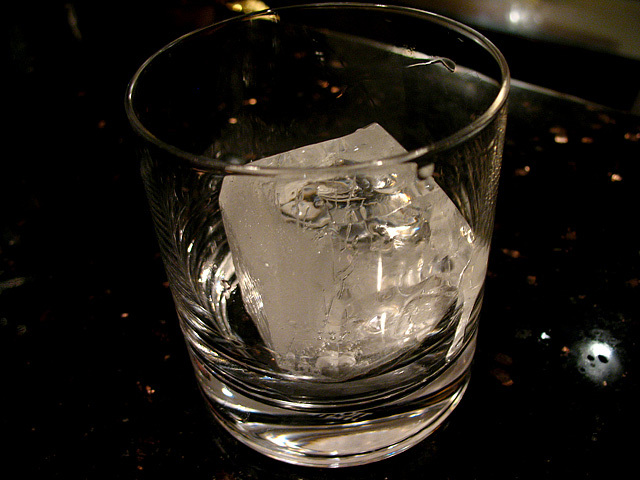 A bartending job in a Japanese restaurant piqued his interest in Japan, where he would go to learn from master bartender Kazuo Uyeda, owner of the Tender Bar and author of Cocktail Techniques. 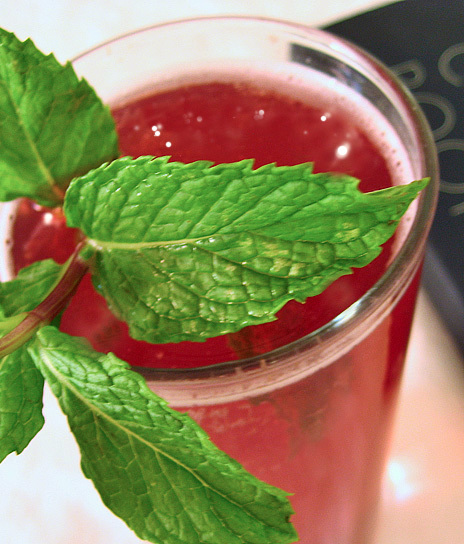 Uyeda is best known for inventing the “hard shake,” an intense, much-debated technique that is said to produce a more chilled, subtle and textured cocktail. Lorincz still marvels at the refined cocktail culture in Japan, where he said “everything is a ceremony” and even a tiny, 8-seat bar will treat customers as if they are five-star hotel guests. Lorincz gracefully demonstrates his mastery of a simple technique. From Uyeda, Lorincz learned that even the simplest technique can make a huge difference. To demonstrate, he asked us to fill our mixing glasses with ice and some water, and stir with our barspoon. A simple request, or so we thought. Balancing the spoon between his third and fourth finger and using what he described as a “push-pull” technique, Lorincz quietly stirred. His arm never moved as his wrist flicked quickly in a fluid motion. Our clumsiness was evident in the noisy clinking of ice and glass, especially when compared to Lorincz’s nearly silent, whirling ice. Lorincz learned ice carving from the Japanese master, Kazuo Uyeda. As he guided us in making the cocktails, Lorincz came around to inspect our drinks and offer taste comparisons of the results. We were all using the same ingredients, tools and measurements, but the level of Lorincz’s craft elevated his cocktails above ours. Lorincz said that in Japan, Uyeda spent 45 minutes talking to him just about orange peels. 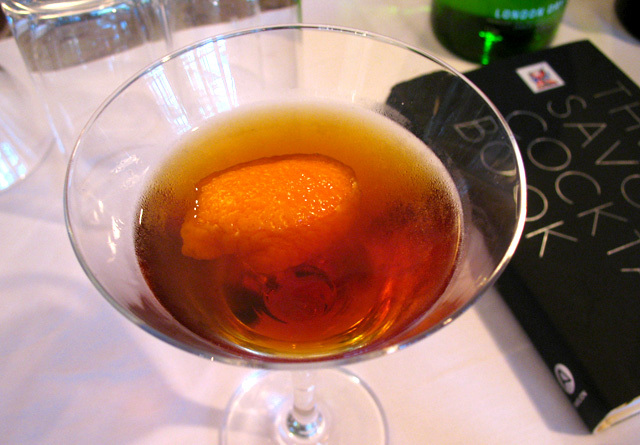 When Lorincz garnished his Hanky-Panky cocktail with an orange peel (see recipe below), he did so with a flourish, squeezing the peel and tracing graceful arcs in the air before dropping it in the glass. Tasting his cocktail against mine, it was remarkable how much more citrus oil Lorincz was able to infuse into his drink from roughly the same sized disk. Asked what it means to be crowned the best bartender in the world, Lorincz said that to be the best at anything is to always be learning, which in his case includes stopping by bars wherever his travels take him. Lorincz had done his L.A. research well: among the bars he wanted to visit were the Library Bar, Roger Room and 1886. At the top of his list was The Varnish, where we met later on for cocktails. Although a booth was available, Lorincz preferred to stand at the bar, and we put ourselves in Varnish GM Chris Bostick’s skilled hands. As he enjoyed his cocktails, Lorincz became just another out-of-town visitor (albeit one wearing a tailored suit and cocktail lapel pin), asking about unfamiliar bottles on the back bar, admiring the design and discreetly taking photos. When they weren’t geeking out on cocktails and spirits, Bostick and Lorincz shared stories about their mutual friend Stanislav Vadrna (like Lorincz a Slovakian-born bartender who apprenticed under Uyeda), who is regarded as the leading advocate of Japanese bartending in the West. It sounds like the opening to a bad joke, but you’d be hard-pressed to find a better snapshot of the global cocktail community than a night when a Slovakian, a native Texan, and a Chinese-American were in a downtown bar talking about mindful bartending and Zen Buddhism while sipping Bulleit Rye Whiskey. For more about Erik Lorincz, check out Josh Lurie’s Q&A with Lorincz and a Wall St. Journal article that features Lorincz’s recipes for his five favorite cocktails. Lorincz said that he’s currently barrel aging the Hanky-Panky with four gins, four vermouths and two bitters, which sounds fantastic. Garnish by squeezing an orange peel over the top. Next was the White Lady, a Sidecar variation made with gin instead of the usual brandy. 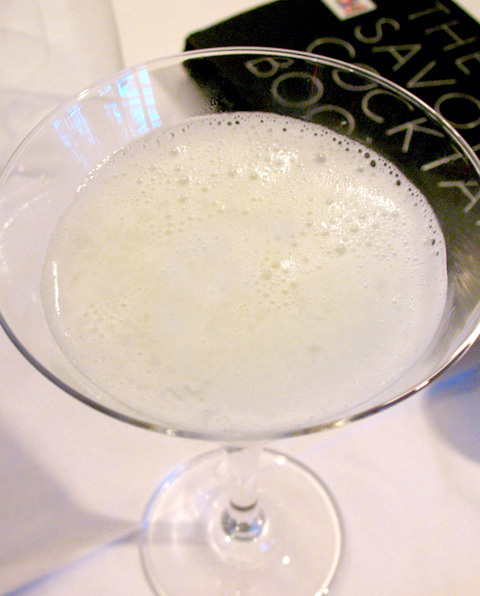 According to cocktail historian David Wondrich, the White Lady was created in 1919 by Harry MacElhone at Ciro’s Club in London. MacElhone originally used crème de menthe, but replaced it with gin in 1929 at his eponymous Harry’s New York Bar in Paris. But this White Lady has another suitor in Harry Craddock, who included its recipe when The Savoy Cocktail Book was first published in 1930. The White Lady became the American Bar’s signature cocktail, and 80 years later it’s still on the menu. The White Lady was the first cocktail that Lorincz made when the American Bar reopened, according to CNBC. Add all ingredients to a shaker tin. Our final cocktail was the bright and refreshing Restoration Celebration, which Lorincz created for the reopening of The Savoy on 10/10/10. The Restoration Celebration follows the American Bar’s tradition of creating cocktails to commemorate important events, such as the Wedding Bells (for Princess Elizabeth’s 1947 wedding to Prince Philip) and the Moonwalk in 1969, to honor the astronauts of Apollo 11. Mix all ingredients except Champagne in a mixing tin two thirds full of ice. Fill a highball glass with ice, and add a quarter glass of champagne. Strain the mixture from the tin over the champagne. To garnish, slap the mint sprig to release its essence, and place it on top of the ice, supported by the rim of the glass.